Do you like Roxy ? Do you like Roxy the Fairy of Animals ? I like her and I´m sad that she is in season 5 only a minor character. Re: Do you like Roxy ? I Don't Like Her. The Fact That She Took The Whole Attention In Season 4 Wasn't That Cool. I like Roxy. It's just that the voice actor for her sounds a little too childish. I know she is still a child, but why not find an actor that fits her age group. I don't think she had used her powers too many times in Season 4. It would be better if I could see her practice her true abilities. JAD2350 wrote: I like Roxy. It's just that the voice actor for her sounds a little too childish. I know she is still a child, but why not find an actor that fits her age group. I agree with you Jad. To me, she sounded like a 7 year old. And yeah Roxy should get more exposure. I don't really like Roxy. 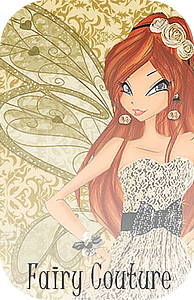 Considering that People THINK She's one of the Winx, a Believix Fairy(I don't really Believe that). Lilliana Mumy made her sound so chilidish. And the fact that Rainbow Decided to recycle Bloom's Story and change it a bit, Not So Great. I like Roxy, I know a lot of people find her annoying and irritating but I think she's cool and I like her story. I also like her personality, she's shy but when she really needs to be she's tough. And that us how I am so maybe it's a personal connection for me. I don't like her! >.< She kept complaining about been a fairy! What is wrong with her? MusaUtau wrote: I don't like her! >.< She kept complaining about been a fairy! What is wrong with her? Yeah, but you imagine some randoms coming up to you and yelling in your face ''YOU'RE A FAIRY". Sure, you and me would be keen, but Roxy wasn't. She had a life that she liked before, then she got a totally new one She just wanted to be an ordinary girl, not something special. i like roxy , i can relate to her becuse we both love animals. i am sad she is only in the background in season five and that jacks dident make a doll of her. she is my favorite . There was an exclusive Roxy doll I think..
MaryKateIsAwesome wrote: There was an exclusive Roxy doll I think..
no their isent .i know all the dolls jacks has made and roxy isent one of them. you are probley thinking of the forien ones. which i cant get becuse i am only 15 and are not aloed to do online shoping and they are too expensive that mom wouldnt by one for me. Wait a minute an exclusive Roxy doll? Where did u see it? On some link? I like Roxy. But one thing about her voice is that she sounds like a baby (no offense) but she sounded like a 7 year-old. I agree with Jad. And her outfit seems to look a belevix but thats her beginner outfit. Lots of people are really annoyed of her anyway. But Roxy dosent annoy me anyway. But she needs be to be pretty strong enough. Nope, the voice actor is Lilliana Mumy and Stella is voiced by Amy Gross. Oh, I must have gotten it wrong. I don't know where or when or who but I do recall someone saying that. » Aspell Saggers Mirror, any info for me please !!! !.